A local sculptor was looking for an assistant for the summer and was offering excellent compensation. Now, I’m used to tweaking my résumé in an attempt to persuade potential employers that despite my random work experience, I am actually perfect for the job, but this time I really was perfect for the job! My work experience ranges from construction to nonprofits to the art world and so, so, so many restaurant jobs. Assist a metal sculptor? Not only am I also a sculptor, proficient in steel and small metals, but I’ve also worked as a carpenter’s and a roofer’s assistant. I have earned my BFA and was awarded my college’s annual sculpture award. Most important, I had, only months earlier, been an assistant to a steel sculptor much like the one I was applying to. Not only were my educational and professional backgrounds perfectly aligned with the job, but I had literally done this job before and had the glowing recommendations to prove it. Bye-bye bartending; hello, making money doing what I really love! Unfortunately, only minutes into my telephone interview, the conversation was derailed. Instead of talking about my skills and experience, we were now talking about how old my kids are and what happens if I need to work late. Umm… my husband would feed the kids dinner and put them to bed? Like he is doing right now while I write this. Honestly, that is what happens many days since he and I split child care and domestic chores 50-50. Why are we talking about this again? Do fathers get grilled on how old their kids are and if they can still work late? I assured my interviewer that I had superb child care in the form of grandparents and a competent partner. Next question, please. 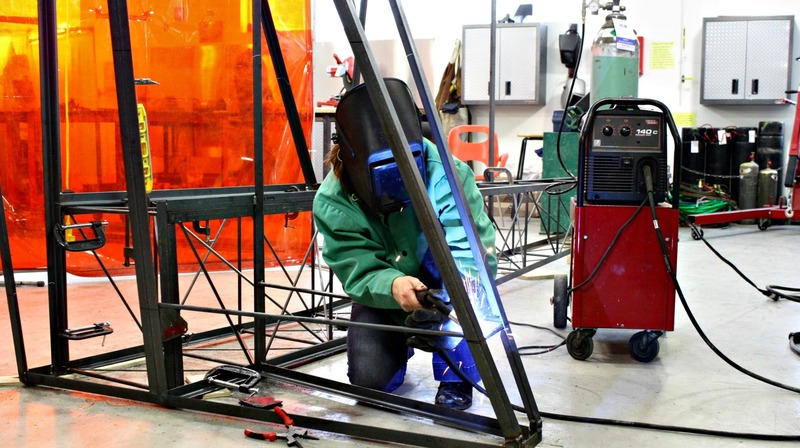 So we moved on to… my welding experience? My own sculptural work? My awards, achievements, experiences at a well-known art school and semester abroad in Australia? No. We would get there eventually, but his next question was more of a concern. He admitted that he’d never hired a woman before. Did I know this was hard work? As in using-an-angle-grinder-for-four-straight-hours hard work? I cannot claim to lift or carry the same weight as a large man can, but hey, neither could a small man with a slight build who could have just as easily been applying for this job and would never have been asked that question over the phone. It seemed he was more curious if I was tough enough for this role. Almost as if he was concerned I might be caught standing around, not wanting to break a nail. Umm… did you look at my résumé? Remember the part where I was a roofer? Where I learned to install metal roofing by hand with antique tools? Heavy antique tools. For shingle jobs, I carried half a bundle of shingles (45 pounds) up a ladder all day in the summer heat. My boss, a man, could carry a full 90-pound bundle, which means I made twice as many trips up and down the ladder as he did, and without complaint. I was not preoccupied with trying to not break a nail; I was busy pounding them. I added that since those summers in my 20s spent pounding nails, I’ve gone on to give birth naturally three times and run a full marathon. I assured him: I’m tough. In the end, my college adviser, who taught me to weld, was asked both for a recommendation and for his thoughts on hiring a woman, especially one with young children. He was at a loss as to how to respond to such a cringeworthy question. All of which is a moot point, because I did not get the job. A young man was hired as lead assistant, though I was offered a position as a docent to greet people, give tours and talk about the work in the sculpture park. A job that does not appeal to me at all, since I much prefer building things to chatting with people. In a professional manner, I declined the docent job. I am reminded of how my old boss, the roofer, said he always hired women when he had the chance, because in his experience, they worked harder than men did. I’m profoundly grateful to the men in my life who have taken the time to share their skills with me, skills that pass so easily from men to boys but less so to girls. Because I want to change my own flat tire, use a chain saw, drive my dad’s farm tractor, improve my home DIY-style and, most dear to my heart, build things. Beautiful sculptures. After I sent a personal email detailing the sexist line of questioning to the sculptor, I copied the content into a Facebook post as a type of public service announcement. I asked those who experienced or witnessed discrimination to call it out and for employers to check their biases. I was overwhelmed by the immediate response — not just the likes, shares and comments, but by how many women who had similar stories, how many men who were disgusted and by how many people in general were thanking me for standing up and saying something. The truth is, the man I was dealing with is not a monster, not a sexist jerk. He is oblivious and old-fashioned, inexperienced with modern, badass females. He maintains that his questions and concerns, framed in the context of my gender and role as a mother, were strictly to ensure there were no injuries in his studio and that expectations regarding scheduling were clear. While I respect his intentions, I do not believe I should have to defend myself in a way a man is not asked to. And it’s not just men who favor other men in the hiring process; women are known to do the same thing, be it not wanting to hire a young woman for fear of her starting a family (many women commented on my FB post with such stories) or a strong female leader because she comes off as less likable. These biases are often unconscious and ingrained, which is why we need to talk about them. Whether it’s being passed over unfairly for a job you are qualified for, being spoken over in a meeting or clear sexual harassment, all forms of sexism and discrimination need to be addressed by women who experience these acts or by the women and men who witness them. Only then will women share opportunities equally with men in the workplace. 2016 is no time for assumptions based on gender. About the author: Sabrina F. Leonard is a sculptor and conceptual artist living and working in Vermont. She attended the Massachusetts College of Art and The Royal Melbourne Institute of Technology before earning her Bachelors of Fine Arts at Johnson State College. Her experience as an AmeriCorps volunteer and her interests in feminism and social justice inform her artwork. She and her husband Adam have three young sons. You can check out her work on Instagram.